Dentistry has come a long way over the past hundred years. Until relatively recently, having any dental treatment was an uncomfortable experience — forget advanced sedation, the fully-reclining dental chair wasn’t even introduced until 1958. 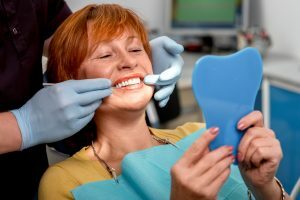 However, perhaps no greater advances have been made in radiographic techniques and how we are able to look at your mouth. Sometimes we need to take a precise look at your oral structures, and a typical two-dimensional x-ray will not give us the whole picture. That’s why your dentist in Boston Kraft & Schrott Dental Associates uses advanced cone-beam scanning technology! What Is A Dental Cone-Beam CT? The dental cone-beam CT (computed tomography) is a way to dive deep beneath the surface image that we can capture with a traditional x-ray. The technology helps your Boston dentist at Kraft & Schrott Dental Associates in advanced treatment planning by creating a three-dimensional recreation of your teeth, the soft tissues (like your gums, tongue, and cheeks), the neural pathways, as well as your jawbone. And all of this information is captured in just one scan. The dental cone beam CT is similar to a traditional CT scan, but specifically for your mouth and oral structures. It exposes patients to less radiation than traditional CT scans and can be performed efficiently in the dentist’s office, minimizing the need for outside referrals. To capture the in-depth image with the cone beam CT scanner, we will have you stand up straight and once you are comfortable, we will move the scanner around your head or in the area of interest in a 360 degree motion. The machine captures multiple images that will be combined into one three-dimensional image. Getting a composite look at the entire mouth takes only about 30 seconds. There is no pain associated with the cone beam CT scanner, no preparation for undergoing the scans, and you can go on about your day as usual right after we take them. Do you need dental implants in Boston, or any other service that goes beyond basic care? Choose the dentist who makes the most out of dental technology. Schedule an appointment at Kraft & Schrott Dental Associates to benefit from excellence, integrity, and caring in dentistry — and the cone-beam CT scanner!